A Land Rover diesel V6 might be Ford’s answer to making the F150 more efficient than the Ram 1500 EcoDiesel and while the EcoBoost engines have made Ford the most fuel efficient gas-powered pickup – a small diesel in the F150 could make it the most fuel efficient half ton truck in the segment. Before getting into the possibility of a Land Rover diesel in a future Ford F150, I should point out that the current 2016 Ford F150 with the 2.7L EcoBoost V6 is the most efficient gasoline-powered half ton pickup sold in America. I have had the pleasure of spending a week in a new F150 (shown above in mud) with this small EcoBoost engine and it really does perform beautifully in every way. However, the elephant in the room is the Ram 1500 EcoDiesel, which does offer better MPGs than the F150 with the 2.7L EcoBoost, technically making the Ram the most fuel efficient truck in the half ton segment. Ford will point out that the diesel engine in the Ram is pricey and that the fuel itself is more expensive, but at the end of the day – Ram still has the half ton truck with the best mile per gallon rating. Ford could “easily” solve that problem with the introduction of their own half ton diesel engine option and according the folks at Autoblog, the F150 could be getting diesel power from the folks at Land Rover. Autoblog recently received images of a Ford F150 test truck with a “Venturi” style exhaust tip similar to those found on the PowerStroke diesel Super Duty trucks. Autoblog’s photographer explained that the truck sounded like a diesel and unnamed sources insist that the engine under the hood is the 3.0L V6 diesel which will also power the Range Rover Td6 models. 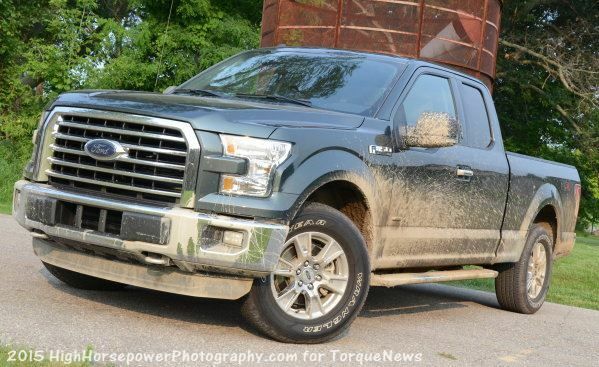 Those sources also claim that this diesel engine will be mated to the same 10-speed automatic that will be used in the upcoming SVT Raptor F150. In the Range Rover, the 3.0L diesel offers 254 horsepower and 443lb-ft of torque so without any changes, this engine would make the Ford F150 more powerful than the Ram 1500 EcoDiesel in both categories (Ram has 240hp, 420lb-ft of torque). More importantly, when fitted into the lightweight F150 and paired with the 10-speed automatic transmission, this configuration shouldn’t have any problems surpassing the Ram’s 29mpg highway figure. Finally, this power Land Rover diesel would likely afford the F150 better towing and hauling numbers than the Ram 1500 EcoDiesel, so should Ford go this route – the F150 would be the most efficient half ton truck in terms of MPG while being more powerful and more capable than the competition’s super-efficient engine options. Of course, this is all based on speculation and insider information, so for the time being, there is no official word from Ford to suggest that there is a V6 diesel F150 on the way. Even with that in mind, if Ford has access to a diesel V6 that will allow them to trump Ram in pretty much every way, it seems crazy for the Motor Company not to give it a shot. Ram's cheapest Ecodiesel is in the neighborhood of $38.5K for a truck line that starts at less than $27K. Add 11.5 thousand dollars to drive a diesel versus the base truck. GM's cheapest Colorado/Canyon with a four cylinder, Duramax is around $34K minimum for a truck line that starts at or about $21K. Add thirteen thousand dollars to drive a diesel compact truck. The closest thing to a reasonably-priced diesel for a truck is the 3.2 I5 that's in the Transit Van or the 4 cylinder in the Ram Promaster, which can be ordered in a cab chasses. With the Transit, the base chassis cab starts at $28,630 and only for a little less than $6K more, you can order one with the diesel. But even here with the transit, the starting price is so high, and you'd end up with a really bare bones truck with no body that would have to be built and mounted, that it doesn't give a lot of bang for the buck @ $34,685 for a cab chassis with no body. And besides that, it's technically a 3/4-ton but far and away, the cheapest 3/4-ton diesel on the market. But for traditional pickup trucks manufacturers are throwing out numbers like $3730 premium or $5,000 premium for a diesel, but that's added only after you pick the expensive version of the truck they want you to buy before you can have their precious diesels, so unless Ford comes in and lets people have work trucks with a diesel at an honest premium of something like $4-$5K, then there are no real diesels in light-duty trucks yet! I couldn't wait any longer and ended up getting an F150 with the 2.7 Ecoboost, and if I'm real careful I can get 23 mpg.